Steve began his racing career in hillclimbing in 1969. He then moved to the Formula Ford series…started competing in rally cars in the mid 1970s… switched to off-road racing in the Mickey Thompson Entertainment Group (MTEG) stadium series in the early 1980s. He won the 1986, 1988, and 1989 Mickey Thompson Off-Road Grand Prix Grand National Sports Truck Championships. 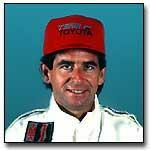 He also won two Indy Lights races in the series’ inaugural 1986 season….switched to the IMSA Camel GT series in 1990. He was the 1990 24 Hours of LeMans Rookie of the Year. He won three races and took five pole positions in 1990. Had seven poles and five wins in 1991..won the 1992 IMSA GTS championship in a Nissan 300ZX Twin Turbo car. He won the 12 Hours of Sebring and had top five finishes in the first four events before his 1993 season ended with injuries at Watkins Glen International. Returned in 1994, and won the IMSA GTS championship…won the 1994 24 Hours of Daytona and 12 Hours of Sebring, and was first in class at the 24 Hours of LeMans. In 1995, he won the 12 Hours of Sebring and was invited to the International Race of Champions (IROC). Has the most all-time wins in IMSA GTS history…20. His 23 pole positions are also a series record.